Martha Jane Rummage was born about 1845 in Stanly County, North Carolina, probably close to the Porter community. She died July 3, 1936, and was the daughter of David Rummage and Beadie Frances "Fanny" Cranford Rummage. She was the granddaughter of George Rummage II and wife Margaret "Peggy" Simpson, a sister of Nathaniel Simpson. Several of my more recent posts have focused on this family. She was also the granddaugther of Nathan Christopher "Kid" Cranford and Sarah Elizabeth "Sacky" Coggins Cranford. The first census she shows up in is the 1850 one with her siblings Henry, Adaline, Lindsey, William, Elizabeth and Irvin. Her mother, Beda (possibly short for Obedience) passed away April 25, 1858, when her youngest daughter was only 13 years old. This must have had an indelible effect on Martha Jane. Older sister Adaline, stayed with the family well into her twenties. She must have been helping her father take care of her younger siblings and the housework. Adelina married that same year to Z. D. Blalock and by 1870, for Martha, the tides had turned. This family grouping is not exactly as it appears. Looking at the original document, "Louisa" is more like "Lonna" and the child was a male. David Rummage is still alive and living with his two daughters, Elizabeth, who was known as Bettie, and Martha Jane. "Lonna" Rummage is actully Bettie's son, Lonnie Oscar Rummage. In 1879, Bettie married Balaam A. Carter. In the 1880 census, Lonnie is incorrectly shown as Lonna O. Carter. The transcriptionist also incorrectly labeled "B. A." as "S. A." and "Bettie" as "Tellie". Looking at the original document, with the family being in the same location between neighbors as Balaam Carter was 10 years prior, you can see the B A and the Bettie. Polly was Balaam's mother. Lonnie Oscar Rummage was married twice and on both marriage certificates, only his mother, Bettie Rummage is listed. It is unknown who his father was. Joseph Rummage never shows back up, so most likely passed away as a child, and was probably also the son of Bettie. Following the path of her older sister Bettie, it was not long before Martha Jane also became "a bird in the branches". David Rummage died October 26, 1876, leaving his unmarried daughter alone. The 1880 census painted a much different picture. In 1880, Martha is now the mother of 3 children. She was most likely expecting Mary already in the 1870 census, and took care of her father until the birth of son Richard. The child would be Lee Allen Rummage, Martha's fourth child and J. B. Simpson was John Brantley Simpson, son of Thomas and Judith (maiden name unknown) Simpson Cagle. On October 10, 1889, Martha Jane Rummage gave birth to her fifth child and fourth son, Millard Talbert, at the age of about 42 or 43. Two years later, she would marry his father, widower William H. H. Talbert (or Tolbert). I will use Talbert, as this is how the living descendants spell their name locally. William H. H. Talbert was the son of Isham Talbert and Edith Crowell Talbert. His first wife was Nancy Emmaline Rummage, the daughter of George Rummage III and Lydia Martin Rummage. George III was the brother of David Rummage, Martha Jane's father, making Nancy and Martha first cousins. Nancy and William had raised a large family of children and Nancy had passed away sometime between 1880 and 1889, when Millard was born. Therein lies another mystery. Nancy Emaline Rummage married Isham Coley in Stanly County on May 29, 1859. They had one daughter, Ida May Coley, born November 3, 1861. Ida is living with Nancy and William H. H. Talbert in the 1880 census, along with her half-siblings. However, it did not appear that Isham Coley was yet deceased. It was probably a case of multiple Isham Coleys, cousins maybe, born relatively close in age. And that it was. There was Isham A. Coley, son of William and Ann, born in 1838. And Isham Coley, son of Sussanah, born in 1838. Both Isham Coley's also served in the Civil War. One Isham Coley, the son of Susannah, died in 1862 and is buried in Virginia. The other lived a long life and died in Stanly County in 1916. His father is listed as "Billie" on his death certificate, making this the Isham who was the son of William and Ann. Nancy Emmaline Rummage, widow of Isham Coley, must have married William H. H. Talbert sometime soon after the death of her spouse in June of 1862. The tombstone of the oldest son of William H. H. Talbert, John Harrison Talbert, shows his birthdate as April 6, 1861. The only way this would be possible is if Nancy Emmaline Rummage was not the first wife of William Talbert and John H. had a different mother. His marriage license to Isabella Swearingen on February 11, 1897 in Cabarrus County, North Carolina, however lists his mother as Emmaline. The 1880 census show Ida Coley being 18 years of age and John H. Tolbert as being 14 years of age, so I have a tendancy to believe this spacing was more accurate and a birth year of 1861 is incorrect for him. The youngest son of William H. H. and Nancy Emmaline Rummage Talbert was Richard M. Talbert, born in 1877. He never married and he and younger brother Millard, son on Martha Jane Rummage Talbert seemed to have hung pretty close at the seams as brothers. We last saw Martha Jane in 1880 with her 3 oldest children. The 1900 census tied them all together. Richard 'Tolbert' was the youngest son of William H. and Nancy Emmaline Rummage Talbert. Lee was not actually a Talbert, but a Rummage, and the son of John Brantley Simpson and Martha Jane Rummage. Then 12 year old Millard was the son of William H. and Martha Jane together. 1910 show only Richard and Millard still living at home. William H. H. Talbert died on June 26, 1917 at about 75 years of age, and is buried at Anderson Grove Baptist Church right outside of Albemarle, North Carolina. Martha Jane lived for a few more decades. The 1910 census finds her living with her daughter, Mary Rummage Coley and family. Her relationship to head of household is shown as "Grandmother", however, she was actually his mother-in-law and grandmother of the children, which is what they probably meant when answering that question. The 1930 census has her relationship correct. Martha Jane Rummage died on July 3, 1936. The informant was her son Lee Rummage, and her age given as "about 91". Cause of death says "No diagnosis". Martha was laid beside her dear husband, William H. H. Talbert at Anderson Grove Church. 1) Mary Elizabeth Rummage born September 20, 1871. She married George C. Coley in Albemarle on April 30, 1900. He was 28 and she was 24. He listed his parent, J. A. and Eva Coley. She listed no parents at all. Mary died December 23, 1932 in Albemarle, Stanly County, North Carolina of Uterine Cancer. Her informant was her husband, George C. Coley. He gave her parents as John Rummage and her mother as Mrs. Martha Rummage, who was still living at the time of her death. He obviously knew Martha, and may have heard Mary give her father's name as "John", but it's doubtful he was a Rummage. The circumstances of Mary's birth was commonly swept under the carpet. Perhaps she was a child of John B. Simpson, as was her brother. --George Washington Coley, born January 31, 1893. He served in WWI, married Iva Shehan and raised his family in Gastonia, North Carolina. He died on April 15, 1965 and is buried at Hollywood Cemetery in Gaston County. --Clarence Calvin Coley, born September 5, 1896. He served in WWII and settled first in Norfolk, Virginia after leaving Stanly County. He married Beulah P. Carrico of West Virginia, and they settled after Norfolk, in South Charleston, West Virginia, where he died and was buried on February 16, 1949. --Burl William Coley, born May 15, 1903. He served in WWII and married Molly Parker of Stanly County. They raised their family in New London, Stanly County, North Carolina. He died July 12, 1970. -- Letha May Coley was the only daughter. She had 3 older brothers and 3 younger brothers. She was born May 28, 1905. Letha May never married and spent her life in Stanly County. She died May 26, 1975. --Frellan Alexander Coley, born July 21, 1907. He served in WWII and married Gladys Moline Dale. They raised their family in Gastonia, North Carolina. He died on February 3, 1968. --Glendon Lee Coley, born September 18, 1909. He served in WWII and married Rachel Beatrice Burleson of Stanly County. They lived for a while in Gaston County, but returned later to Stanly. He died February 5, 1978. --Richard Guy Coley, born February 2, 1912. He served in WWII and married in Philadelphia, Pennsylvania to Rita Marie Detrano and settled in Virginia for the most part. He died May 20, 1954 and was buried in Alexandria, Virginia. 2) Richard Anderson Rummage was born January 5, 1874. The Rummage family had a neighbor named Richard Anderson with whom Martha's father David had business and land transactions with. Perhaps Richard A. Rummage was named for him. He married Rosa E. Leonard on October 13, 1901 in Albemarle. She was the daughter of J. W. and Laura Leonard. Richard gave for his parents only the name of his mother, Martha Rummage. Richard served in WWI and WWII. Richard died March 3, 1945 of a farm accident. The informant was "J. A. Rummage", and his mother was given as Martha Rummage and father unknown. 1905 - 1962 Lillie Mae Rummage, married James C Russell. 3) William Riley Rummage was born October 3, 1879, in Albemarle, NC. He died on October 5, 1982 in Gold Hill, Rowan County, NC. He was married to Margaret "Maggie" Hampton on November 1, 1906, in Albemarle, NC. She was the daughter of Levi Jackson Hampton and Lydia Beaver Hampton. They started their family in Albemarle, but later moved to Gold Hill, where they remained. On Riley's marriage certificate he only gives his mother's name as "Rummage". No father listed. On his death certificate, his wife was the informant. She gave his mother's name as Martha Rummage and his father as "Henry Rummage." Again, in cases like these, it is commonly not talked about to spouses or children in later years, except perhaps a brief mention, if any at all. This may have been a reference to William H. H. Talbert, his stepfather. Martha was never married to a Henry Rummage. Or, his father may have been a man named Henry, who gained Martha's surname on the death certificate, as in the case with John B Simpson becoming "John Rummage". Oddly enough, there was another William Riley Rummage in the area. He was born in 1859 in Mecklenburg County, twenty years older than Martha Jane's William Riley. Ironically, he was the son of Henry A. Rummage and Jemima Rhodes Rummage and married Flora "Florence" Hopkins and died in Albemarle in 1939. 4) Lee Allen Rummage was born March 23, 1882 in Albemarle, Stanly County, North Carolina and died on November 11, 1947 in Albemarle, North Carolina. He was married twice. First to Lou Tom Caudle, the mother of his three children, and daughter of Tom Caudle and Annie Ross Caudle. When she passed away on February 1, 1925, Lee married Lina Neal Lowder Mauldin, the daughter of Moses A. Lowder and Polly Ann Surratt Lowder and the widow of Jacob J (J. J) Mauldin. Lee Allen, according to a Bond located in the court records of Stanly County, was the son of John Brantley Simpson, a married man, neighbor, and friend of Martha's father David Rummage. He had signed as witness to several land transactions involving the Rummage family and David specifically. Lee Allen did not acknowledge his biological father. On his marriage licenses, he only named his mother as Martha Talbert on one and Martha Rummage on the other, as she was married to William H. H. Talbert by that time. He married first on November 22, 1905 and second on March 27, 1926. When Lee Allen Rummage died of Cancer in 1947, the informant on his death certificate was his wife Livaneal or Lina Neal. She named his mother by her maiden name and in place of father was "Don't Know'. He was buried at Silver Springs Church south of Albemarle. Millard Talbert was born Oct 10, 1889. He passed away March 4, 1943 at the age of 54. He was the only son Martha Jane Rummage had by husband William H. H. Talbert, as she was in her 40's when they wed. There are no records that Millard ever married or had children. He stuck very close to his brother Richard Talbert. He had two half-brother named Richard, Richard Rummage and Richard Talbert. 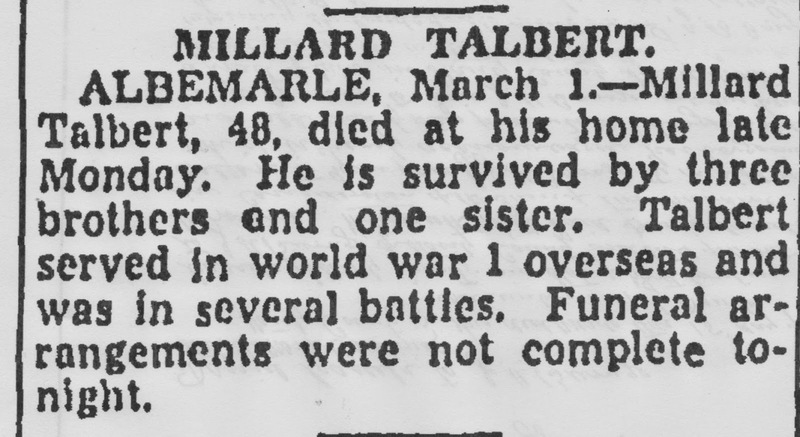 Millard was a soldier, serving in WWI and sustaining an injury. His obituary in the Greensboro Daily News stated that he had served in many battles. His registration describes him as Medium build with blue eyes and brown hair. Like many soldiers, Millard became a victim of war and never recovered. He returned a troubled soul. His death certificate stated that he passed away of Chronic Alchoholism. 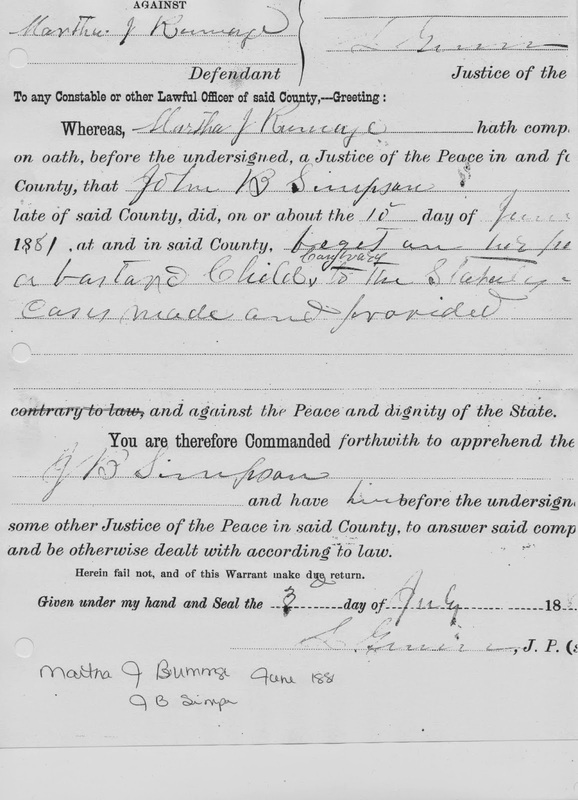 From familysearch.org, the marriage license of Martha J Rummage, daughter of David and Beady, and William C. Foard, son of John C Foard and Mary Ann Osborne. Who was William C. Foard? If they were married, why does Martha appear in the 1880 census as a Rummage? Why do her older children all bear the name Rummage throughout their lives and not the name of Foard? They married on March 2, 1871. Oldest daughter Mary was born September 20, 1871, just 6 months later? Why was she not a Foard?